London was given the unenviable task of reviving the Olympic Games after the Second World War. The 1948 Games were the first global sporting event since the war, although there were several conspicuous absentees. The Germans were not invited, the Japanese declined an invitation and the Soviets were in sporting isolation. Athletes were housed in military barracks or converted classrooms and conditions that many athletes today would snub were tolerated, given the circumstances. It was the start of the television era and, although TV sets were in short supply, pictures of Wembley Stadium and the Empire Swimming Pool were beamed into viewers' homes for the first time. Dutch mother-of-two Fanny Blankers-Koen won four gold medals and set the only athletics Olympic record of the Games in the process. The record came in the 80metres hurdles (11.2 seconds) and she also won the 100m (11.9secs), 200m (24.4secs) and 4x100m (47.5secs). Starting blocks were used in athletics for the first time, and there was the first political defection when Marie Provaznikova, president of the Technical Commission of Women's Gymnastics, refused to return to Czechoslovakia. 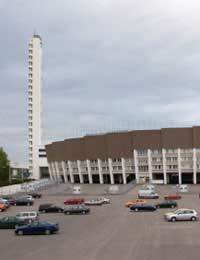 The USSR took part for the first time in Helsinki in 1952 and, as it was the start of the Cold War, Soviet athletes were housed in a separate village. Israel made its debut and the Germans returned. Germany had been split in two and the west returned as the Federal Republic of Germany, but there were no athletes from the east present. Amazing Émil Zátopek clinched an incredible treble. The Czechoslovakian won the 10,000m in 29 minutes and 17.0secs, and four days later added the 5,000m title in 14:06.6. Three days later he won the marathon in two hours, 23 minutes and 3.2secs to complete one of the greatest Olympic displays. Political boycotts hit the Melbourne Games in 1956. Egypt, Lebanon and Iraq pulled out in protest at Suez Crisis, while Holland, Switzerland and Spain withdrew in outrage at Soviet intervention in Hungary, where an uprising against the Stalinist government was crushed. The communist People's Republic of China boycotted in protest at the presence of Taiwan under the name Formosa. Nevertheless, delegations from throughout the mingled during the closing ceremony, an innovative celebration that became permanent. Australian law posed a problem too, as the six-month quarantine imposed on foreign horses meant equestrian events were switched to Stockholm in May, ahead of the Games in Melbourne in November. Hungarian boxer László Papp, who won middleweight gold in 1948 and light middleweight gold in 1952, completed the hat-trick with a points win over American José Torres in Melbourne. On the track, Soviet Volodymyr Kuts emulated Zátopek by winning the 5,000m (13:39.6) and 10,000m (28:45.6). A record 84 nations were represented in Rome in 1960 and more than 100 television channels broadcast live and recorded footage to 18 European countries, USA, Canada and Japan. Ghana's Clement 'Ike' Quartey became the first black African Olympic medallist with silver in the light-welterweight boxing, but his achievement was eclipsed by barefooted Abebe Bikila, a member of Ethiopia's Imperial Bodyguard and winner of the marathon. American sprinter Wilma Rudolph landed triple gold in the 100m (11.0secs), 200m (24.0secs) and 4x100m (44.5secs). Her 100m time was three-tenths of a second inside the world record, but was not ratified due to a tailwind of 2.47m per second. The maximum permitted wind assistance is 2m per second. The star of the boxing ring was an 18-year-old from Louisville, Kentucky called Cassius Clay. An eccentric out of the ring, the American proved to be lethal in it and won middleweight gold before going on to conquer the world as Muhammad Ali.